Hennepin County Board Chair Jan Callison supports Sheriff Richard Stanek’s decision to send deputies to North Dakota, according to an email she is sending out in response to constituent opposition to the move. That is to say, unlike private security guards, the Hennepin County Sheriffs deputies won’t use mace and attack dogs. However, it still means that our local resources are being used as a part of a disproportionate, highly militarized, and provocative response to silence the Water Protectors. With the current tremendous power imbalance, it is reasonable to ask whether this truly is “a resolution where the rights of all are respected” or in any way fair. To me, the answer is no. Here is Callison’s full email, provided by her office. Many groups have organized against this decision. For example, the Sierra Club North Star Chapter has a letter urging Hennepin County to withdraw its resources. Click to sign. For many more pipeline updates, keep reading. 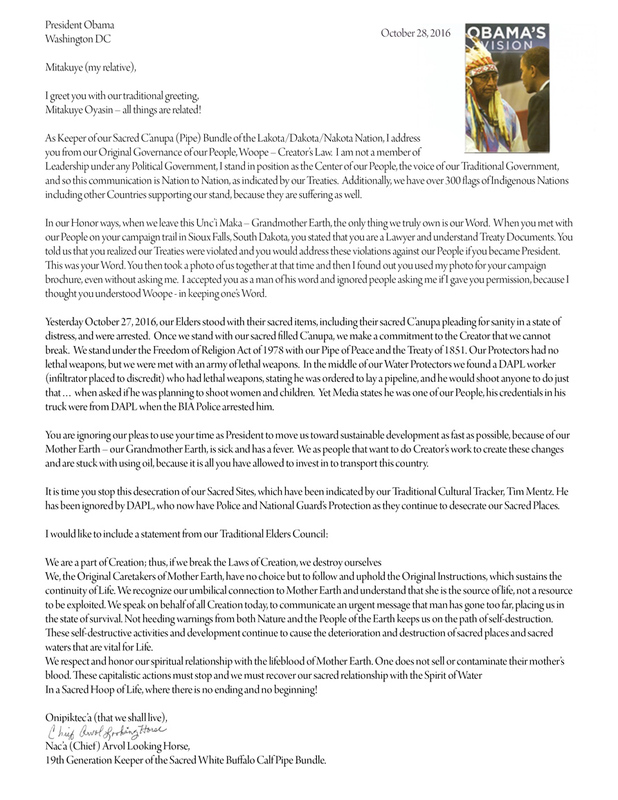 Chief Arvol Looking Horse, 19th Generation Keeper of the Sacred White Buffalo Calf Pipe Bundle, has written a to President Obama, telling him to keep his word and stop the desecration of sacred lands. Looking Horse’s letter also includes a statement of how a pipeline backer was trying to infiltrate and undermine a recent action by the water protectors. Yesterday, October 27, 2016, our Elders stood with their sacred items … pleading for sanity in a state of distress, and were arrested. … We stand under the Freedom of Religion Act of 1978 with our Pipe of Peace and the Treaty of 1851. Our Protectors had no lethal weapons, but we were met with an army of lethal weapons. In the middle of our Water Protectors we found a DAPL worker (infiltrator placed to discredit) who had lethal weapons, stating he was ordered to lay a pipeline, and he would shoot anyone to do just that … when asked if he was planning to shoot women and children. Yet Media states he was one of our People, his credentials in his truck were from DAPL, when the BIA Police arrested him. Here is the link. Please sign and share. Last month, Dakota Access bulldozed two miles of burial grounds. Their private security sicced dogs on and pepper-sprayed those who tried to protect the site. This company cannot be trusted. Urgent action is needed to prevent Dakota Access from continuing to violate federal laws. We demand to be heard, and we will continue to stand together for our nation, and for all who live with and by the Missouri River, until justice is done. MSNBC reported Oct. 26 that it has requested statements from both Clinton and Trump as to whether they support pipeline construction, but had received no answers. Trump’s campaign has received a $100,000 donation from the CEO of the pipeline company, MSNBC said. Trump also has an investment in the pipeline company of between $500,000 and $1 million. Democracy Now! reports on indigenous youth who occupied Hilary Clinton’s campaign headquarters to demand that she take a stand on the pipeline. Now is the time to put pressure on both candidates. We already have reported on the numerous statements coming from religious denominations in support of the Water Protectors at Standing Rock. Church leaders also are visiting in person, a sign of the importance spiritual leaders are placing on this work. Here are two examples. I want to now suggest that Standing Rock may be the new Selma. This may well be the moment when nations come together, when peoples of goodwill come together to transform this world from the nightmare that it often is into the dream that God intends so that clean water is available to everybody, so that every man, woman and child knows the peace and the goodness that God intends for us all. I can assure you that even if the pipeline goes through, this story is not finished. I see this as a kairos moment in which to open a wider conversation of how we treat our indigenous brothers and sisters and how we care for our sacred earth and waters. We are sure there are other examples of religious leaders visiting the camp. Please send them our way, with statements. Seeking Stories from Minnesotans at Standing Rock: The group Showing Up for Racial Justice Minnesota (SURJ MN) is collecting data and personal stories from Minnesotans who have traveled to Standing Rock and experienced mistreatment/abuse by law enforcement. Here is the form. Please share. Ties to Wounded Knee: MPR reports on water protectors at Standing Rock who have connections to Wounded Knee, both a descendant of the 1890 massacre and a supporter of the 1973 Stand Off. [It was] enacted for “the protection of archaeological resources and sites which are on public lands and Indian lands, and to foster increased cooperation and exchange of information between governmental authorities, the professional archaeological community, and private individuals.